After more than 10 years of planning, fundraising and restoring, the historic Bagdad Mill Site in the western Panhandle has been transformed into a large green space and waterfront park for the community to enjoy. Santa Rosa County officials, along with federal, state and local project partners, officially opened the park on May 16. The 21-acre site, located at the confluence of Pond Creek and Blackwater River in the historic community of Bagdad, was previously the setting for the Bagdad Land and Lumber Company sawmill, which operated from 1835 to 1939. 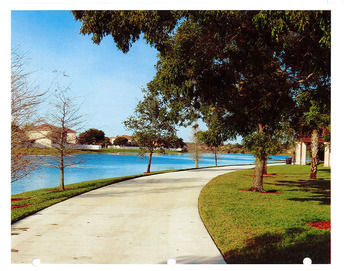 The site was acquired by the State of Florida Board of Trustees in 2000 and was leased to the county for development as a passive recreation area in 2004. Grand opening activities included a ribbon cutting ceremony and unveiling of a Florida Heritage Site Historical Marker describing the significance of the Bagdad Lumber Mill and shipbuilding in Bagdad. After the ceremony, community residents and visitors explored the park and enjoyed a historical presentation by period-dressed actors. Park amenities include a kayak launch, fishing pier, multi-purpose trail, picnic tables and educational panels that highlight the history and ecology of the park. Park improvements were funded in part with grants from the Land and Water Conservation Fund, Recreational Trails Program and Coastal Partnership Initiative Program. The Bagdad Waterfronts Florida Partnership worked closely with Santa Rosa County to create the park’s master plan, coordinate volunteer activities and assist with fundraising activities. An additional 150 trees, funded with a 2016 Urban and Community Forestry Grant, will be planted in the park in late 2016. Among the species chosen for planting will be longleaf, slash and loblolly pines, significant to the site’s former use as a southern pine lumber mill. The park is located at 6953 Main St. in Milton and is open during daylight hours. Sam Carr and other local dignitaries celebrated the national recreation trail designation for the Bartram Trail in Putnam County. John Bartram and his son, William, were naturalists and authors who explored the majestic St. Johns River in the 1700s. The legacy of William’s extensive travels and writings entices today’s modern explorers who can follow in his footsteps and river wake. A wealth of online resources offers adventures within a slice of pristine Florida by hiking, cycling, paddling and taking driving tours of the Bartram Trail network in Putnam County. The Bartram Frolic, held in Palatka Sept. 4 and 5, was designed as an annual event to create awareness of the Bartram Trail in Putnam County. In addition, the designation of the Bartram Trail by the Department of the Interior as a National Recreation Trail was celebrated. One of only six trails selected nationwide, this prestigious award highlights the legacy of Bartram’s travels and is certainly well-deserved. Palatka hosted a fun weekend bash including local music, art show, kayak poker paddle, bike tours, boat tours and much more. "It started as a small idea and a small committee," said Sam Carr, one of the volunteer organizers. "At every turn, we had people saying, 'Go on. Go on. Go on.' It can't get any better than this." The St. Johns River-to-Sea Loop Alliance now has a website for the trail, one of two top priority regional trails for SUN Trail funding. ArcGIS Online Story Map Tours have now been completed for all designated paddling trails that OGT coordinates. Photos show access points, campsites and points-of-interest. OGT will miss Brian Ruscher, who left OGT to become a planner for Alta Planning and Design in West Palm Beach. Brian worked as a planner for OGT for three years and spearheaded coordination efforts for the Florida Coast to Coast Trail. The Florida Paddling Trails Association (FPTA), which supports paddling trails statewide, plans to expand their Legacy Fund next summer season with a goal to double this year’s number of 42 scholarship children sent to paddling summer camps. The Connections newsletter now has almost 30,000 subscribers! That's a 90 percent increase in four years. Celebrate Florida Greenways and Trails Month! October is Florida Greenways and Trails Month and that means drier, cooler days—perfect for getting outdoors! Take some time to explore a wooded path or glide down your favorite river or stretch of coastline. The Office of Greenways and Trails, within the Florida Department of Environmental Protection’s Division of Recreation and Parks, welcomes this annual occasion to highlight the variety of local and regional trail activities throughout the state and their health and economic benefits. For paddling enthusiasts, several statewide events are scheduled, leading up to November--Florida Paddlesports Month. These include the Paddle Florida Suwannee River Wilderness Trail trip Oct. 17-24, and several guided day trips in Florida state parks. 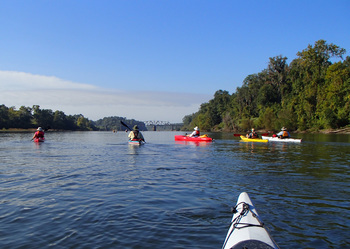 Also, 18 paddlers will take part in the annual Apalachicola RiverTrek Oct.11-15 to support the Apalachicola Riverkeeper. Bicycling events are highlighted by the Gainesville Cycling Festival Oct. 22-23, and includes the always fun Ride of the Living Dead cycling event on the Cross Florida Greenway Oct. 29. Dress up in your favorite Halloween costume. Florida State Parks are offering a variety of local trail-related events. Find an event near you! Keep checking the Florida Greenways and Trails Community Calendar for scheduled trail events throughout the year, and the online trail guide for places to go. Florida has more than 10,000 miles of land-based trails and almost 4,000 miles of paddling trails that provide vast benefits for Florida's economy and tourism and the health and well-being of trail users. From left to right: Commissioner Adam Putnam, Attorney General Pam Bondi, Estus Whitfield, Megan Eno, Cynthia Henderson, Governor Rick Scott, Holly Parker, Jim Kern, Alex Stigliano, Sandra Friend, John Keatley and Howard Pardue. 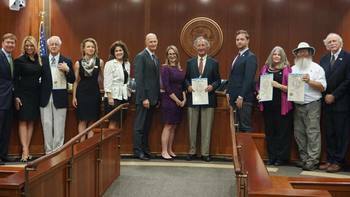 As part of the 50-year celebration of the Florida Trail Association (FTA), the Governor and Cabinet honored FTA officials with a resolution of support at the Sept. 20 Cabinet meeting. FTA founder Jim Kern spoke of the Florida National Scenic Trail's benefits and urged officials to support finishing the 1,300-mile footpath. FTA members and supporters will congregate in Deland Oct. 20-23 for the FTA's 50th Anniversary Conference. Speakers include Fran Mainella, former director of the National Park Service and Florida State Parks, and FTA founder Jim Kern. Conference participants will learn about the history and future plans of the FTA and the Florida National Scenic Trail. The non-profit FTA was founded by Kern in 1966 to promote hiking throughout the state and to develop a long-distance trail. The first section of what was to become the Florida National Scenic Trail was a 26-mile trail in the Ocala National Forest. To date, 1,000 miles of the 1,300-mile trail is considered complete and efforts continue to be made to close significant trail gaps. The trail is largely maintained by volunteer FTA members who work out of 18 local chapters. Sabal Pines Greenway Trail in Coconut Creek in Broward County. The Apalachee Bay trail system features nine paddling trails that vary in length and difficulty. Most of the land along the system is publicly owned, including Bald Point State Park and the St. Marks National Wildlife Refuge. Other trails approved by the council include a privately owned section of the Florida National Scenic Trail along the Suwannee River, and the Hilton Road Greenway and Sabal Pines Greenway Trail in Broward County.